Everyone has heard of Cheltenham Gold Cup Week, Glorious Goodwood and of course The Grand National but what about Hexworthy Races? No, I didn’t think so but on the Dartmoor calendar this along with Bellever and Huccaby races was an event no self-respecting moorman would miss. This was a time when all the great and the good would wind their way upon the moor to enjoy, weather permitting, an exciting day at the races. Here all the thoroughbreds and not so thoroughbreds would compete from prizes no Newmarket trainer in his right mind would ever get out of bed for. Sadly today you are more likely to see Galloway cattle racing across the moor as opposed to the Galloway ponies which competed at the Hexworthy Races. 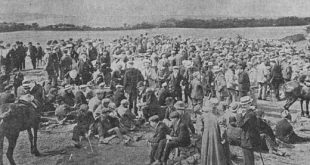 ‘In all the changing scenes of life I little expected to find myself this day of grace, September 11th, 1890, on Wickett’s Ground, Dartmoor. Mr. Coaker of Sherberton, has kindly allowed the use of this elevated spot to the committee who for some time past have been earnestly engaged in promoting the first races held within living memory of the present generation at Hexworthy. What they did in the time of the Romans deponent cannot say. I would like to mention the names of these noble sportsmen of to-day, but they have modestly not allowed them to be advertised, so I am prevented handing them down through the columns of the “Flying Post.” I hear a great deal of Mr Coaker’s kindness, and I believe that he and two other relatives did good work in the cause taken up so heartily by many neighbours. Like other meetings this year, the entries are not numerous. The prizes are, however, sharply competed for by Galloways and ponies of various heights and ages, classed according to the former qualification. The principal prize (£5) was won by the second horse at the post, Mr. Cafe’s Tommy, the first in (Nimrod) taking the wrong side of the post. Nimrod was also first in two other races, and was far better than his field; but a protest was entered after the races, one of the conditions being that neither horses nor jockeys winners of £6 prizes would be allowed to compete. The rider of Nimrod ungenerously argued that although the prize he won elsewhere was called £6, yet having paid an entrance fee of 7s he had only won £5 18s. This nice point in sporting law is referred to the authorities on such matters, probably the Jockey Club! Mr. Herbert Lindon officiated as starter, and Mr Ernest Hawker made a first-rate judge. Deciding disputes at these local derbys is no sinecure. There is a good old maxim in North Devon, not unknown in these parts, “Win if you can, or if not tie, in the failure of either event, wrangle.” There is a good deal of wrangling going on to-day, but a firm judge and an enlightened committee such as we have here works wonders. The Consolation Stakes were won by Tommy. Whether by Mr. Cleve’s or Mr. Coaker’s Tommy in the hurry of my friend to depart Prince town in order to catch a train, my information is uncertain. Before, however leaving the Down, a word is due to the surroundings. The rays of sun light up the glorious scenery, and the heat is tempered by a cooling breeze from the north. The fleeting clouds throw their shadows on the Moor and add to the beauty of the scene. In the absence of haze which has danced attendance on the east wind, distant objects are perfectly clear. Through a gap at Dartmeet are plainly to be seen the towers at St. Marychurch. Old Bellever to the north stands out in grand prominence, with Hamildon for his back ground. To the west and north-west, Hessary, the crown of Prince town, Crockern Tor, and guardians of the lonely Moor keep their everlasting watch and ward. There are certain advantages in these race meetings. The incidents are picturesque, the people come in small knots from various quarters, some on horseback, others driving in conveyances of every description, but the majority favour Shanks’ Pony. From this height you look down on the gathering of the clans and observe the progress for a long distance. Few habitations are visible. Just here and there, amidst a clump of trees, a farm-house peeps out. It is a puzzle were all the people come from. A few have found there way from Plymouth, Tavistock, Ashburton, Moreton, and even places beyond, but the majority are locals. All the shops have evidently shut early. Another pleasant feature is the absence of the usual frequenters of races who make these gatherings hideous. There is only one intruder, a proprietor of a “Ring ’em for a stick.” I saw a good many fees pass, but not many walking sticks distributed to winners. No betting ring. No charge for admission to the grand stand. Rough deal planks fixed along the southern side of a stone wall of cyclopean architecture provides ample accommodation. The only representative of her Gracious Majesty present was K91, a very good specimen, too. I hope this race meeting will be a permanent institution, the situation is grand and the ground most suitable. Here began my adventure. I got on very well across a field and through a plantation: then in front of me I found a stream of some fifteen feet width, which I afterwards learnt was the Swincombe. I did not like the job of crossing the stream of unknown depth, over stepping stones considerably wide apart, and many of which were under water. I was in doubt whether to try for a better crossing up or down the river. I knew that some little way below was Hexworthy Bridge, so I set off for that, hoping to catch my friend there. Alas! my way was rough and boggy, and being much longer than I thought, occupied a considerable period of time, the many “ups and downs” also fatiguing my poor old limbs. My friend, I found, had passed the bridge half and hour, and as he had to catch a train, I was not surprised to learn that he was pushing on “smart like,” I wend my way to the Forest Inn where anglers most do congregate, hoping to get a trap, for I did not relish a tramp of some six miles odd to Prince town. Every vehicle is at the races, so I have no alternative but to pad the hoof or try for a conveyance elsewhere. I call at Mr. Mallock’s cottage at Hexworthy. Unfortunately the worthy member for the Torquay Division was not in residence. A gentleman occupying the house listens gravely to my “tale of woe,” but I perceive that he is not struck with my appearance, and small blame to him: I am dusty and muddy and worn out. He kindly suggests that I should try my luck at Dartmeet, where a Mr. Caunter has a dog cart he lets for hire. I jog on to that romantic spot, a long half mile, but a weary body and uncertain mind are not gay contributors to the enjoyment of the scenery. Neither have I time to pay my respects to the “White Gate” at Brimpts. (Why Brimpts?) This gate was made by the French prisoners in the war-time, and is of very hard wood. At length I reach Mr. Caunter’s Dartmeet House, only to find that he, like his neighbours, was at the races. I then set my face towards home, and take my chance of a lift on the way. Fortune, however, favours the tired as well as the brave, and about half a mile from Dartmeet, near White Gate, I meet a man with a cow, who, upon being challenged, answers to the name of Caunter, listens to my “tale of woe,” and very readily, although late, agrees to drive me to Princetown. I return with him down the steep hill and whilst he is getting his nag from the field and putting to, Mrs Caunter gets me some tea, with bread and butter and eggs, so I settle down comfortably. I am surprised to learn from the visiting book that at Dartmeet House, which is but a cottage, dignitaries of the Church, Judges learned in the law, and all sorts and conditions on men and women find at times their home under Mrs. Caunter’s roof If the good lady provides for her guests as promptly and comfortably as she is doing for me, I do not wonder at their expressions of approval. The daughter is immensely pleased at an interview she had with Bishop of Exeter, who by his kindness when she was here quite won the little woman’s heart. The names of many of our Exeter folk appear in the visitors’ book. I am pleased to hear such grateful tributes as Mrs. Caunter and her husband paid to the memory of the late Mr. R. Dymond. Mr. Caunter is a chatty man, and we are not long getting back to Princetown. On the way we meet the manager and proprietor of Duchy House, who also conducts with his mother and sister the Duchy Hotel. He was kindly driving towards Hexworthy in search of the wanderer. In fact when at nine o’ clock I had not returned some alarm had been felt. However, all’s well that ends well and instead of feeling the next day “done up” as I should do if I had dragged my poor “old bones over the stones” from Dartmoor to Princetown, I am as fresh as a sixty-three year old could expect under the circumstances. This Prince town is a grand place. Its association with the convict prison is a bit gloomy, but extensive views and such opportunities for rambles, the idea of the neighbourhood of prisoners soon passes away. This is my second visit this year, and if the wonderfully fine weather we are now having continues, I hope to make a third. Mr. Rowe and his family at the hotel and the Duchy House are untiring in their attention to visitors. Sometimes the trains turn out a number that tax their resources for a time, but the pressure soon passes, and the ordinary visitors are never neglected. I feel so much at home here and meet such pleasant people, that I always regret when the time for departure arrives. OLD STAGER. ‘The stony track descending to the mine (Bachelor’s Hall Mine), originally a branch from the Tavistock – Ashburton track, leads to a bridge over the Blacka Brook which, immediately above the foot of Bachelor’s Hall Brook, is surely the ugliest ever to have been built on the Moor. Its single arch gives access to Lower Watern Newtake, and it was much used in the days of the Stud Farm at Tor Royal kept by the Prince of Wales (later King Edward VIII).’, (1983, P.375). There may well be no question that race meeting were held in Lower Watern Newtake at some point in time but the problem is that either ‘Old Stager’ got completely lost in 1890 or that particular year the Hexworthy Races were held in a different location and I would plump for the second options. He mentions in his article that he crossed ‘a stream of some fifteen feet width, which I afterwards learnt was the Swincombe‘ which meant if he was in Lower Watern Newtake his journey would have been in a very extended east/south-easterly direction which was in the opposite way to Princetown – back to square one! Whilst attempting to get to Gobbett the ‘Old Stager’ says how ‘I got on very well across a field and through a plantation: then in front of me I found a stream of some fifteen feet width, which I afterwards learnt was the Swincombe. I did not like the job of crossing the stream of unknown depth, over stepping stones considerably wide apart, and many of which were under water’. Again the map shows a plantation that leads to some stepping stones which cross the River Swincombe. Accordingly if this assumption is correct then the highest viewpoint in the area stands at 351m and could well be what is referred to as Wickett’s Ground? Since writing this article I have come across the 1840 Tithe Apportion for the Forest of Dartmoor and as can be seen below Wickett’s Ground is named and recorded. It is listed as plot number 1189 and consisted of 40 acres, 3 rods and 38 perches of coarse ground. The other clue that could possibly point to this being the correct location is when the author comments on the, ‘a stone wall of cyclopean architecture’. This could only refer to the work of John Bishop the noted Dartmoor newtake wall builder whose enclosures where renown for their size. Incidentally he once lived about half a mile south of Sherberton Great Newtake.